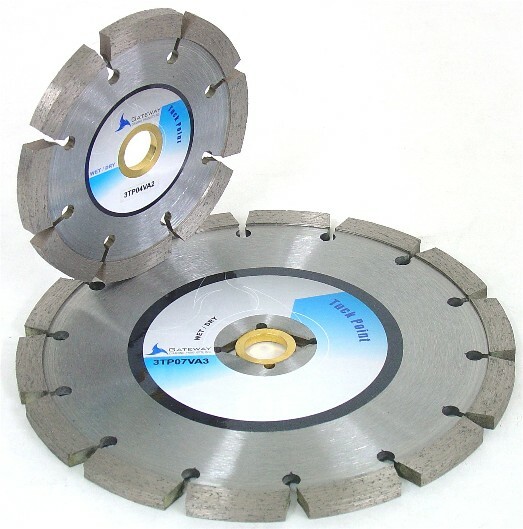 10 mm rim height provides great cutting performance at an economical price. The 2TP series is designed for cleaning out mortar joints and repairing cracks on masonry structures. 2TP04VA2 4" .250 10mm 7/8" - 5/8"
2TP07VA3 7" .250 10mm DM - 7/8" - 5/8"
10mm rim height offers maximum blade life and performance at minimum cost. The premium 3TP series is designed for cleaning out mortar joints and repair cracks easily and quickly on masonry structures. 3TP04VA2 4" .250 10mm 7/8" - 5/8"
3TP07VA3 7" .250 10mm DM - 7/8" - 5/8"